Posterous, which launched in June, is one of those sites that I tested and it stuck – I continue to post pictures to it regularly. What I like about it – you don’t have to create an account to use it. Just start emailing text and files (images, video, whatever) to post@posterous.com and you’ve got a site where it all goes. And they’ve steadily added features. You can, for example, repost all the stuff you email in to Twitter, Facebook, Flickr, Tumblr or wherever. Today the company is announcing a new product, group blogs. You can add your friends or family’s email addresses to any Posterous site you control, and they can then email stuff in too. It’s useful for families, sports teams, etc. to share photos and video. Once you’ve added those emails, all they have to do to post is send whatever they want to publish to post@sitename.posterous.com. No registration required. An example is here, and see the image below. 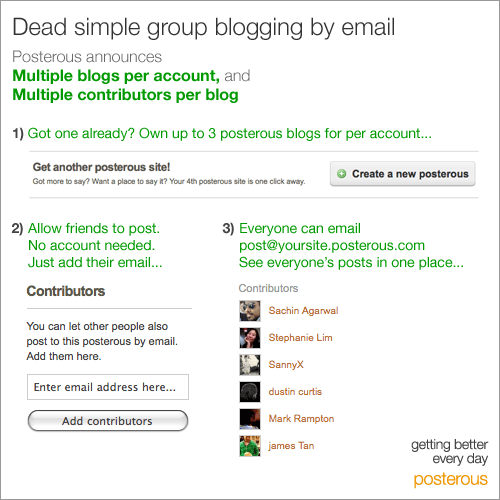 Posterous is a Y Combinator startup. They also just raised a second angel round of financing – $725,000 from XG Ventures and a whole bevy of high profile individuals.